The French satirical weekly Charlie Hebdo's Publishing Director Stéphane Charbonnier displays the front page of the newspaper as he poses for photographers in Paris. 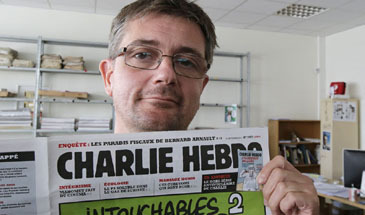 Masked gunmen stormed the Paris offices of Charlie Hebdo on y Jan.7 (Wednesda), 2015, killed 12 people including the cartonist Charb for the reason of blaspheming Mhhammad. I was first made aware of the horrific attack on Charlie Hebdo employees by my mother. She was watching the rolling news coverage, phone in hand, trying to contact my father who was travelling on the Eurostar at the time. A wave of panic rushed through me; the sense of being far removed from such events evaporated. My dad was absolutely fine. The same cannot be said for the poor souls who lost their lives that day. As ever, social media’s armchair commentators were on hand to give their take on the events. “Je suis Charlie” quickly became a sign of solidarity for free speech advocates, but as “revenge” attacks against the French Muslim community intensified, an oft-ignored darker side to support for free speech manifested. Admittedly, the necessary groundwork for a market anarchist conception of free speech must not involve government censorship of controversial or offensive statements (credible threats of violence notwithstanding). However, a worrying number of libertarians and liberals conflate their support for this conception of free speech with the condoning of Charlie Hebdo‘s arguably racist “satire.” Some utterly refuse to accept this charge of racism, but even those who do often attempt to justify themselves with an argument symptomatic of uncritical liberalism and libertarianism. An inflammatory cartoon depicting racial stereotypes — and indeed any behaviour specifically targeted to cause offence — is supposedly necessary to push the boundaries of free speech. It’s symptomatic of a wider phenomenon: ‘trolling’ being portrayed as liberal or libertarian. Whilst Scott Sayre at The Atlantic has highlighted that Hebdo often targets France’s far-right racists, Slate’s Jordan Weissmann draws attention to the fact that it also uses racist imagery “in a country where Muslims are a poor and harassed minority, maligned by a growing nationalist movement that has used liberal values like secularism and free speech to cloak garden-variety xenophobia.” The French state exacerbates this hostile environment, having enacted measures such as the face covering ban and the ban on wearing conspicuous religious symbols in government schools. Supporters of free speech and of Charlie Hebdo‘s content get noticed, but reasonable peoples’ reactions are similar to those against PETA — “I hate them and they make me really angry.” This is exacerbated by the various strawmen that such uncritical free speech advocates accuse their critics of. Criticise them and you are “against free speech” or “making excuses for the Hebdo murderers.” These obvious falsehoods are juvenile and lazy. This kind of support for free speech is damaging perceptions of free speech itself. It also fuels the fire of extremely prevalent Islamophobic attitudes in France. It’s not the state’s job to forcibly censor Charlie Hebdo, but we as individuals ought to condemn it nonetheless. The above writer, Daniel Pryor, is an intern at the Center for a Stateless Society (c4ss.org). Also holding a position on the executive board of UK Liberty League, he has previously worked for the Adam Smith Institute and held the role of Deputy Editor for The Backbencher. Pryor is a market anarchist, taking a particular interest in drug policy and immigration reform. Originally from Essex, he now studies Philosophy, Politics and Economics at Durham University in the UK.